Ladies and gentlemen, here’s one you do not want to miss! For the first time ever in Australia two of the world’s great jazz performers will be joining forces to showcase their exceptional talents, in one very special show. 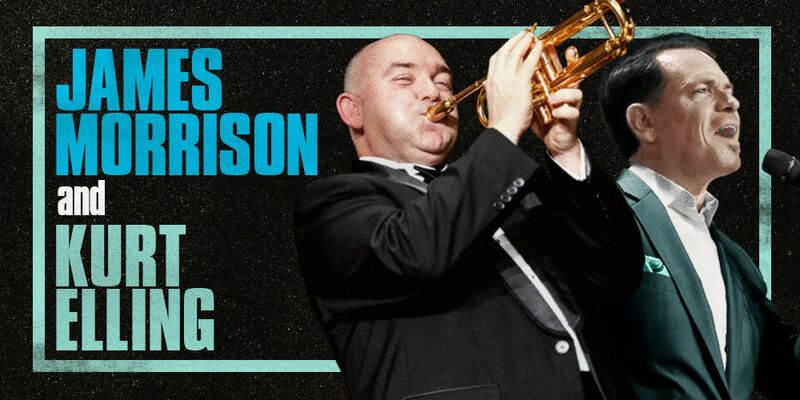 What a scintillating combination, world-renowned trumpet maestro and ARIA Award Winner, James Morrison, and the stand out jazz vocalist of our time, Chicago’s Grammy Award Winner, Kurt Elling, together at last! Get ready to be mesmerised by renditions of your favourite jazz standards and be entertained by the brilliant showmanship and infectious energy of these gifted performers with some of the best jazz musicians in the country, including the amazing New York based saxophonist, Troy Roberts. Don’t miss this rare chance to experience these international jazz greats together for the first time. It promises to be the jazz concert event of the year. You’ll be swingin’ from the first note! "Elling is the standout male vocalist of our time"
"A kind of Sinatra with superpowers"